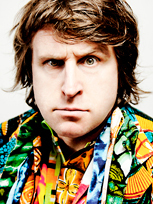 Milton Jones can be seen regularly on Mock the Week (BBC2), he recently appeared on the latest series of Live at the Apollo (BBC1). His Lion Whisperer Live tour played to over 100,000 people in 2011 and his 2103 tour On the Road is set to play to more in 2015. 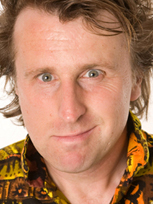 Milton has co written and performed in nine of his own radio series for BBC Radio 4 and in 2012 Another Case of Milton Jones won the Silver Sony Award for Best Comedy. He is a previous Perrier Best Newcomer and Nominee, the winner of two Sony Awards and a British Comedy Award nominee. Other TV credits include; Lee Mack’s All Star Cast (BBC1), Michael McIntyre’s Comedy Roadshow (BBC1) and Dave’s One Night Stand (Dave). His sitcom pilot The House of Rooms co-written with Dan Evans went out last January on Channel 4. The wild-haired Milton Jones has raised wordplay to the level of fine art.